Reata means "lariat" in Spanish and is so named because an authentic lariat must be cured in the earth, like the roots of a grapevine. Roots are the most important part of the vine because, if the root system isn't efficient in absorbing much-needed nutrients and water, the grapes will not benefit and neither will the resulting wine. Reata is crafted by the Jamieson Ranch in Napa. The winery was founded by long-time wine professional, Bill Legion, who, for nearly 20 years, headed a large conglomerate of wineries and was one of the driving forces in developing sparking wine for Ariel Non-Alcoholic Wines - without question, the finest product in the category. The grapes for this treasure came from Los Carneros. This appellation is quite unique, in that it is roughly half in Napa County and half in Sonoma County. Most wineries use grapes from one or the other, but regardless, the grapes are fairly similar since it's a relatively small appellation. 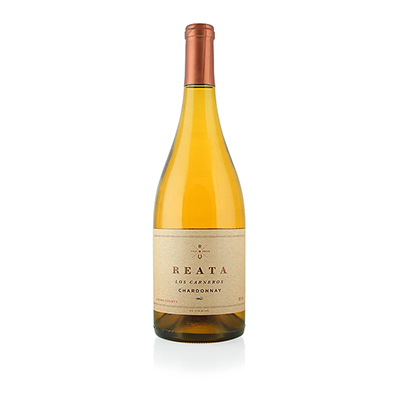 Reata takes from both, ergo the Los Carneros appellation. Winemaker Linda Trotta shows off her finesse and experience here with this delicate offering, a veritable basket of flavors from apricot to honeysuckle, apple, pear and spice. Only 30% of the wine was aged in oak barrels, just enough to add a soft vanilla swing to the already exotic and engaging nuance that goes from start to finish.